The Valentino logo made a memorable debut. For the next several months, the Museum will be posting intermittent items looking at the influence of the Valentino archive on current and recent collections. First up: The heritage logo. The Valentino logo made a memorable debut. In 1968, the maison staged its groundbreaking "Sfilata Bianca" show in Rome: Comprised of all white, or near-white looks—Mr. 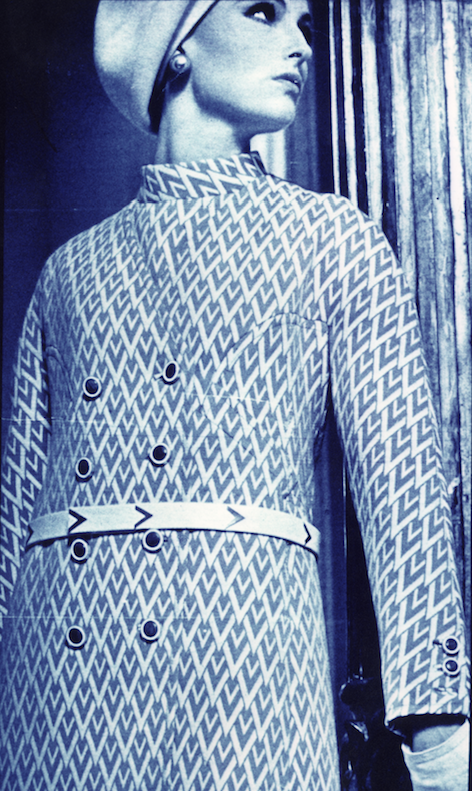 Valentino referred to his palette as "non-color"—the collection placed its emphasis on the design elements embedded in the monochromatic clothes; one of these elements was the metallic "V"-shaped hardware found on pieces such as the A-line wool coat, one of Mr. Valentino's iconic Sixties-era looks. The "V" resurfaced in 2014, when Maria Grazia Chiuri and Pierpaolo Piccioli staged their special event show in New York City. Paying homage to Mr. Valentino's Sala Bianca and Sfilata Bianca shows, Ms. Chiuri and Mr. Piccioli snuck V shapes into their looks, e.g., cutting a V-shaped flap on the pocket of a white wool coat modeled after the one from the Sfilata Bianca collection. Last year, however, Mr. Piccioli—now ensconced as the sole head of the atelier—dispensed with such subtle gestures, and devoted much of his Resort 2019 collection to explorations of the Valentino logo. These experiments included appending heritage V-shaped hardware to the flaps on the front pockets of wide-leg jeans and V-shaped stitching on the pockets in back, designing an all-over graphic print of heritage Vs and making metallic V-shaped chandelier earrings. Since then, the heritage V has recurred with some frequency in the Valentino collections, making a notable appearance, for instance, on the bags the models carried at the Fall 2019 ready-to-wear show in Paris. Sharp-eyed spotters also may have noticed that the handbag Angelina Jolie has been toting of late features heritage V hardware. Which just goes to show: More than 50 years after its debut, the V logo has lost none of its geometric appeal.